Everyone wishes for longevity, wealth, and fortune. Include these fun Asian Whirls in your next Chinese New Year celebration, or International Party. You'll receive three Asian Whirls per package. Each whirl is made of a red or gold metallic spiral with a cardstock icon attached at the bottom that reads FORTUNE, WEALTH, and LONGEVITY. Each whirl measures forty inches when hanging from the ceiling. For similar Asian decorations take a look at the Chinese Centerpiece, and the Asian Invitations and Seals (8/Pkg). Quality party decorations at a great price. At first I was hesitant to purchase the items that I did as they seemed expensive and out of the decorating budget that I had for our Homeowners Association's Chinese New Year Party. But when they arrived I was extremely pleased. Can't find this quality in any of the stores near me. Everything is of such good quality we will be able to use them year after year. I highly recommend them to anyone needing decorations. So fun!!!! 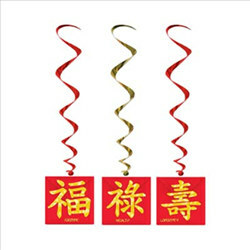 Perfect to hang from the ceiling and add whimsy to any Chinese New Year or Asian party theme. We used these to decorate our home for our newly adopted Chinese son's welcome home party. Since you get 3 in a package - we ordered two packs - hung 1 set over the buffet table and 1 set over the party table/gift area. So cute!